VPN.com has released the world’s largest VPN comparison tool, giving people the only way to quickly review and compare hundreds of VPN providers. With VPN.com, you can see the exact list of VPNs that fits your needs and budget in a few clicks. Michael Gargiulo, Founder of VPN.com (https://www.vpn.com), has crafted a mission with a grand objective: Help 100 million people find the right Virtual Private Network (VPN) by 2022. He’s off to a running start with one of the largest domain name purchases in 2017—followed by the rollout of their much-anticipated VPN comparison chart; it provides rich statistics and reviews on hundreds of VPN providers. 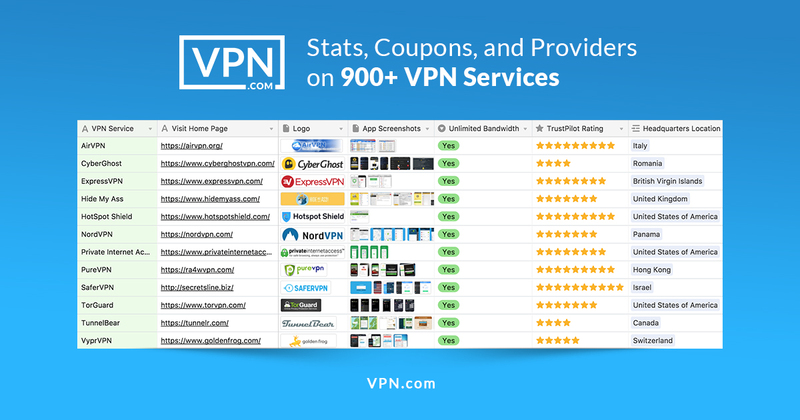 VPN.com’s new comparison chart is comprised of more than 188,000 data points. The organization of the data was an enormous undertaking that required the skills of 11 cybersecurity and technology experts spanning the course of more than three years. It’s the only place online where visitors can find the features, pricing, server locations and more for over 900 VPN providers. The global demand for VPNs is skyrocketing. Google now reports 13 million monthly searches for the term “VPN,” up from 1 million just two years ago. In the US, the recent rollback of net neutrality has sparked even more interest, with federal law now permitting cellular and internet service providers to sell a user’s browsing history or slow down their connection unless they're using a VPN. Other companies—like Hotels.com, Cars.com and Apartments.com—have had multibillion dollar success stories in their respective industries using a similar model and an exact-match dotcom domain. VPN.com is on-track to follow suit as it trends towards its goal of helping 100 million people find their VPN by 2022. 188,000 data points across 900 VPN providers, giving people the only way to quickly review and compare hundreds of VPN providers. Through transparent research, extensive testing and visitors who share its work, VPN.com can help 100 million people find their VPN by 2022.